A Personal Invite... We would love to see you! 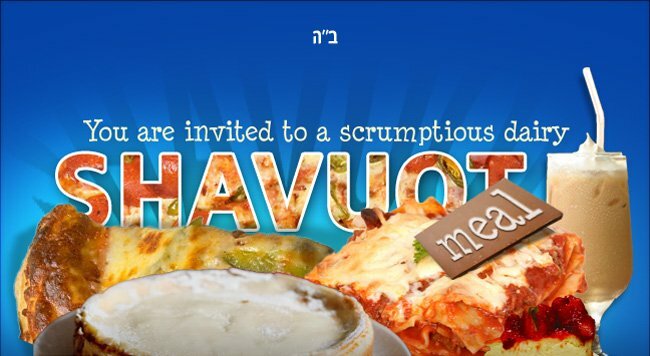 You are cordially invited to join for a scrumptious Shavuot dairy feast, together with family and friends. Located at 10 Ave. & Corner of Calle 6 (2nd floor entrance on 10 Ave), Playa Del Carmen, Quintana Roo 77710 Mexico. We will be having a special kids program ! Shavuot, celebrated this year May 23-25, 2015, marks the anniversary of the day when we received the Torah at Mount Sinai. It is the second of the three major festivals (Passover being the first, and Sukkot the third), occurring exactly fifty days after the second day of Passover. This is a biblical holiday complete with special prayers, holiday candle lighting and kiddush. During the course of the holiday we don't go to work, drive, write or switch on or off electric devices. We are permitted to cook and to carry outdoors. The word "Shavuot" means "weeks"; it marks the completion of the seven-week counting period between Passover and Shavuot. During these seven weeks, the Jewish people cleansed themselves of the scars of Egyptian slavery and became a holy nation, ready to enter into an eternal covenant with G‑d with the giving of the Torah. 1. On the holiday of Shavuot, a two-loaf bread offering was brought in the Temple. To commemorate this, we eat two meals on Shavuot -- first a dairy meal, and then, after a short interruption, we eat the traditional holiday meat-meal. 2. With the giving of the Torah the Jews now became obligated to observe the laws of Kosher. As the Torah was given on Shabbat no cattle could be slaughtered nor could utensils be koshered, and thus on that day they ate dairy. The Torah is likened to nourishing milk. 3. Also, the Hebrew word for milk is "chalav." When the numerical value of each of the letters in the word chalav are added together - 8, 30, 2 - the total is forty. Forty is the number of days Moses spent on Mount Sinai when receiving the Torah.